Learn to dance Cajun two-step, waltz and jig. Zydeco is a vibrant accordion-driven dance music. Many have discovered that although listening to Zydeco is great, dancing to Zydeco is heaven! This 1 hour and 42 min. video features detailed instruction of the Cajun two-step, waltz, and jig. Along with the instructor, five dancing couples demonstrate each of the dances. The instruction takes you from the very basic or novice level through the intermediate / advanced level. Each move is explained very deliberately. The complex moves are illustrated several times with the instructors in various positions (facing camera, back to camera, side to camera). Two-Step: Includes basic step, dance position with partner, techniques for foot turns with partner, and detailed illustration of the movement of the dance on the dance floor. You will also be introduced to the Shadow Dance as a special feature. Waltz Instruction: Includes basic step, dance position with partner, techniques for foot turns with partner, a number of hand, arm, and turning movements while dancing, and detailed illustration of the movement of the dance around the dance floor. Jig Instruction: Includes basic step, dance position with partner, and the structuring of a type jig for a dance of about three minutes There is no prescribed sequence for the jig dance. The three minute dance instructed in this program is designed to give you a series of hand and arm movements with minimum repetition of the various moves. If you don't learn the hand and arm movements, you don't have a dance, as the movements are the essence of the dance. Lagniappe (something extra): Included is 15 minutes of several demonstration dances. This portion is designed to provide you with examples of the liveliness of Cajun dancing and to acquaint you with some group dances that can be done to the jig step. 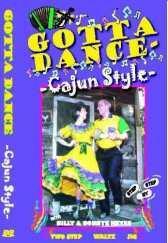 These featured dances are: a fast paced single couple Jig, a four-some (two couple) dance, an eight-some (four couple) dance, a five couple type of Cajun folk dance, and a combination of a five couple train and Mardi Gras umbrella dance. Good news for aspiring Zydeco Dancers!!! Zydeco Dance From A to Z has just been released! Zydeco is an infectious accordion-driven dance music of the Creole and African-American communities of southwest Louisiana and gulf coast Texas. This is a Zydeco dance instructional DVD that brings together the time-proven videos, Learn to Zydeco Dance Tonite and Advanced Zydeco Dance, into one comprehensive package. Dance instructors Ben Pagac and Debbie Shaw regularly explore the southwest Louisiana Zydeco dance halls and bring to the viewer not only the authentic steps, but also the joy and sprit of the dance. The teaching method is relaxed, clear, and easy to follow. Part one breaks down the fundamental step, demonstrates the subtle Zydeco weight shifts, explains partnering, and provides more than twelve moves and step variations. Part two progresses with more than 20 challenging moves and variations. The entire DVD clocks in at 90 minutes, so there is a lot of valuable material covered. Additionally, the DVD is professionally authored with menu buttons that allow you to selectively jump to desired sections without having to scroll. Country Western, Swing or all our other Dance Videos and DVDs.